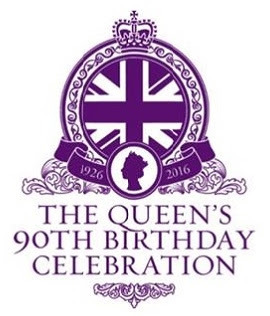 This morning we had the first meeting of our planning group for St James & St Anne's celebrations for the Queen's 90th Birthday in June. 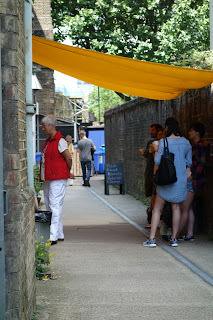 Lunches, street parties, and community celebrations galore will be taking place all over the country on Sunday 12th June, and here in Bermondsey we are planning an Open Air Service of Thanksgiving in the Churchyard at 10.30am followed by a community fun day with barbeque, disco, dancing, games & sideshows. It should be a right royal celebration. More details will follow in due course but just to get blog readers in the mood for the celebrations to come, here is Southwark Council's video of the Queen's Silver Jubilee visit to the borough in 1977. In view of his lifelong association with St James's Church it was Barry Albin-Dyer's wish that his memorial service would be held in St James's and we are delighted that we will be able to host this service for family, friends and local community, close to the first anniversary of Barry's death, on Saturday 25th June at 11am. Everyone is most warmly invited to attend this service for the man they called 'Mr Bermondsey' who will be long remembered in this community with affection and thanksgiving. There are only fifteen statues of women in London. Three of them are queens. 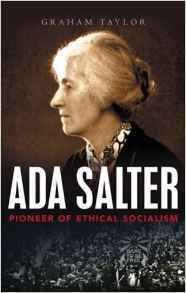 One of them is Bermondsey heroine, Ada Salter (left). 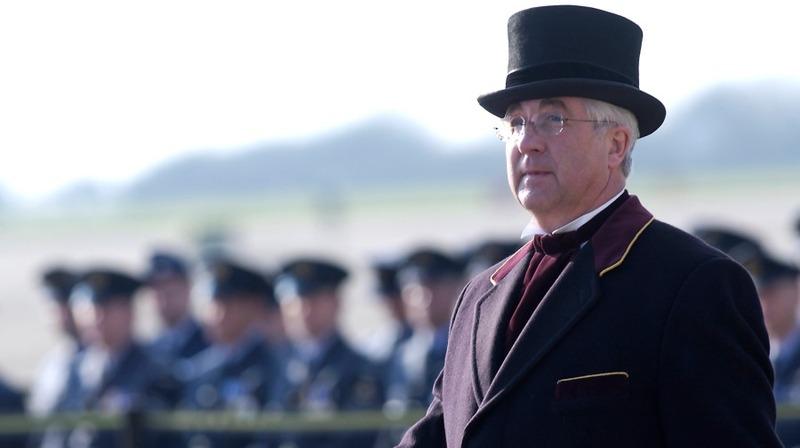 It is Graham Taylor's contention that the contribution of Ada has been rather overshadowed by that of her husband, and indeed that some of the achievements traditionally attributed to Alfred were actually Ada's. In many instances, he was the supporter; she was the initiator. She was the first woman councillor and the first Labour councillor in Bermondsey. She was the first female Labour councillor in the whole of London. In time she became the Mayor of Bermondsey and a member of the LCC (London County Council). 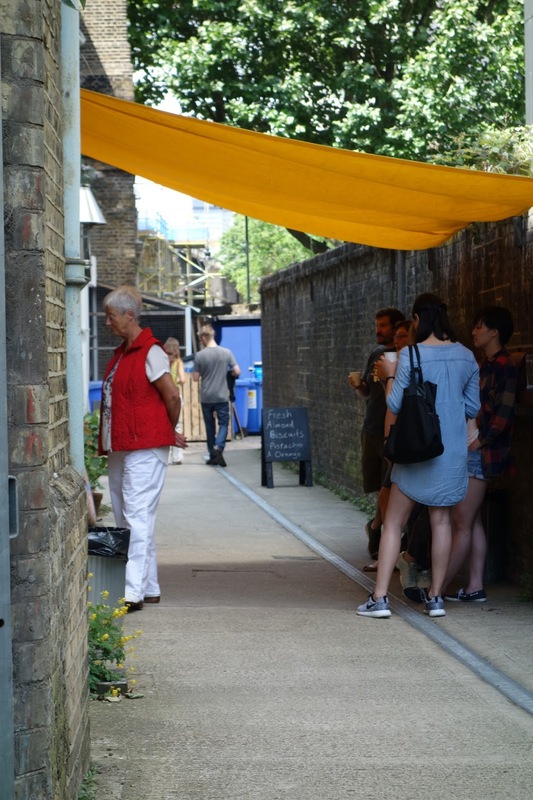 Famously she set up the Bermondsey Beautification Committee which oversaw the planting of over 6,000 trees in the streets and saw the borough blossom, as flowers were planted in every park, churchyard or piece of scrap land. When she died in 1942 her memorial service was held at St James's Church, where the vicar was one of the Salter's closest friends and supporters. Later the Old English Garden in Southwark Park, which she had helped to create, was renamed, in her honour, the Ada Salter Memorial Garden, and much later, Ada's statue joined that of her husband, Alfred, and daughter, Joyce, on the banks of the Thames, a fitting tribute to Bermondsey's gem. 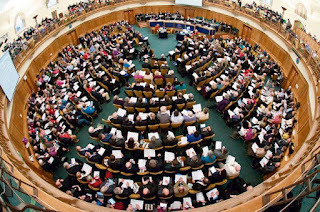 Day 3 of the Church of England's General Synod in Westminster. After lunch and a fascinating and moving presentation by the Living Out group at a fringe meeting which I attended, Synod spent the rest of the day debating the Reform and Renewal agenda. First of all, was quite a technical and complicated debate about the way ministerial training is going to be funded in the future, all in the context of the Church's plan to increase the number of ordinands (ie vicars-in-training) by 50 per cent. Next was a presentation, followed by questions, on 'resourcing for the future'. This about was about how the Church's central funds can be allocated in the future to (1) mission in the poorest communities in our country and (2) to investment in new growth opportunities. Again there was a welcome focus on an outward facing church, committed to growth, which concluded this short, but encouraging, group of sessions in Westminster. 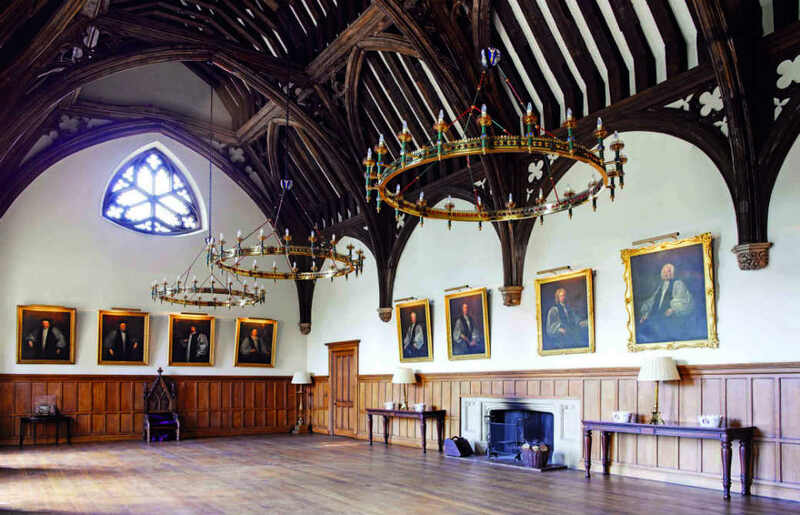 The Synod meets next at the University of York in July. 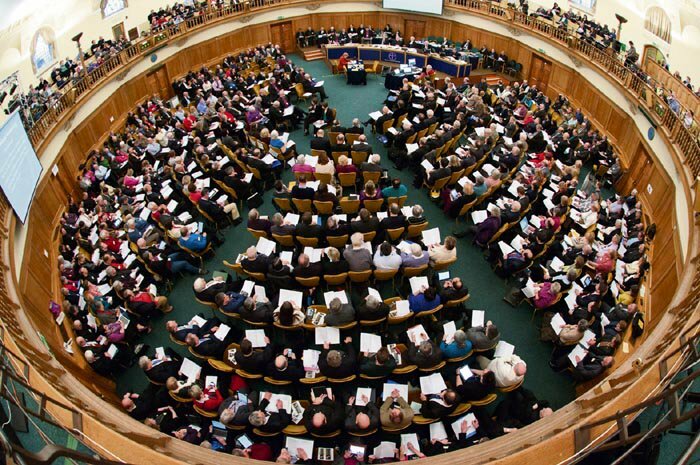 Day two of the Church of England General Synod's meeting in Westminster. 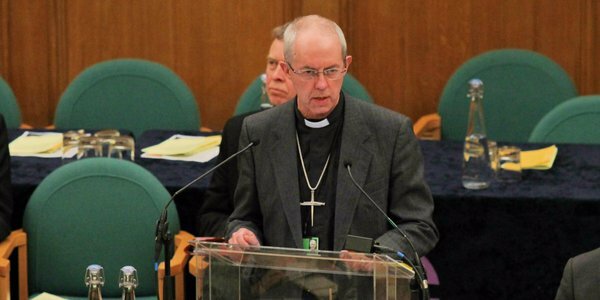 The whole morning at Synod was given over to the work of the Archbishops' Task Group on Evangelism. Synod began with worship andf discussion in twenty small groups of 22-23 people spread across Church House and Lambeth Palace. The aim was to enable synod members to bring their own experience and insights on evangelism, and to share their own stories of coming to faith. Highlights of the presentation and the debate that followed included the Bishop of Burnley's passionate call for the church not to neglect the poorest people in our country living on the outer estates and our own Diocese's Captain Nick Lebey CA speaking about his amazing work as an evangelist among young people in Thamesmead. Lunchtime for me was a fringe meeting about resourcing ministerial education (ie training new vicars) and the Church's ambitious plan for a 50% increase of people training for the ordained ministry by 2020. Back in the chamber there was a debate about the Church of England's relationship with the Church of Scotland, and then a motion about wedding and funeral fees (which failed) and another motion that in time might make it easier to modify church legislation (which passed). This left a bit of spare time so we went straight on to a notion from the Diocese of Leeds about blood and organ donation. This was unexpectedly moving and powerful as a number of synod members, including a consultant surgeon, shared their stories. The press had got wind of this story and one paper said: the CofE doesn't just want your money, it wants your blood, too. The reality was that members were encouraged to view blood and organ donation as an act of Christian generosity and a contribution to the common good, the ultimate Good Samaritan act. By now it was 7pm and the end of a long Synod day, but there was just time for Evening Worship, led by a lively contemporary worship band. It was wonderful to end the day on a high note of praise. 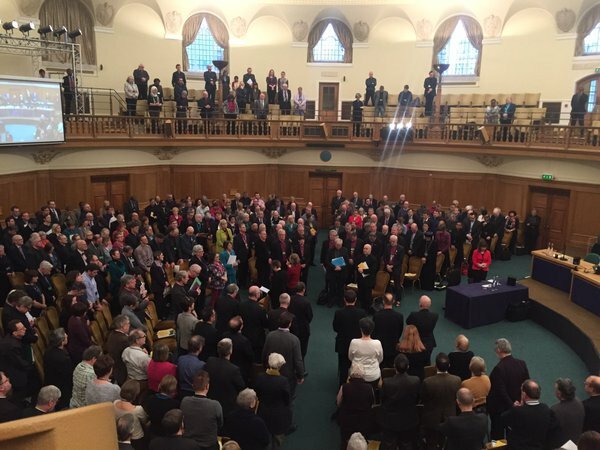 General Synod, the Church of England's parliament, gathered today in Westminster for its February group of sessions. The Synod began by standing in silence (left) in commemoration of the first anniversary of the martyrdom of twenty-one Coptic Christians. It was a sobering moment at the beginning of our gathering to be reminded of, and to pray for, our suffering brothers and sisters throughout the world. After opening worship we heard from the Archbishop of Canterbury in an extended Presidential Address of the recent meeting of the Anglican Primates in Canterbury. Next up was some legislative business - part of the Reform and Renewal agenda, designed to produce a leaner and fitter church, better equipped for mission. The simplification group have the task of cutting out some unnecessarily complicated rules and regulations and today we had the first hearing of their proposals. 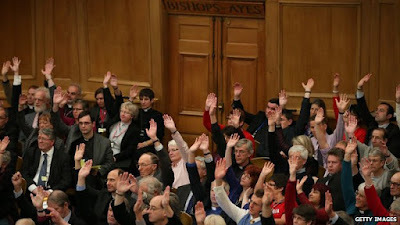 Next up was a presentation about the shared conversations on spirituality, scripture and mission that are to take place at the next meeting of the synod in York, before it was time for Question Time when synod members have the opportunity to ask bishops, archbishops, and the leaders of various church institutions, questions on just about anything, except their opinion. The focus for question time has to be on facts, or it gets ruled out of order by the chairman. 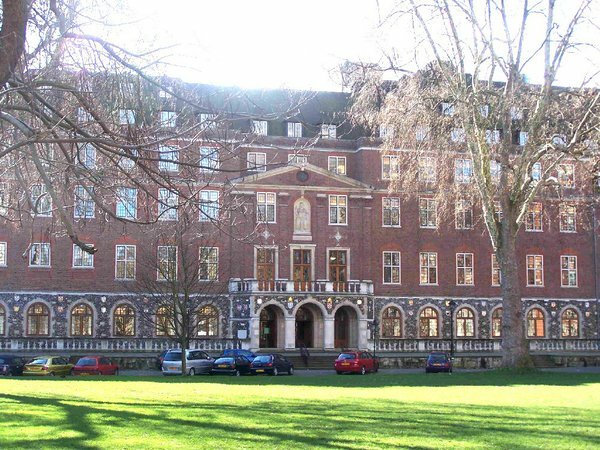 Southwark Diocese, together with the Bishop of the diocese and the Dean of the Cathedral, has 7 lay representatives, and 7 clergy representatives on the General Synod. Bermondsey readers will be pleased to know that two of the 14 elected reps are local boys, both from St James & St Anne's. Warm congratulations to Sir Simon Hughes from all at St James and St Anne's on his appointment, announced today, as head of public affairs at the Open University. Steve Hill of the OU is reported on the SE1 Website as saying: "Simon brings with him a wealth of relevant experience and insight, as well as sharing our commitment to social mobility and opening up access to education." Here in Bermondsey we are delighted that Simon continues in his role as Chair of Governors at St James's School, another aspect of his long term commitment to education. 'What are they doing to the church?' passers-by have been asking themselves this week as scaffolding has gone up at the east end of the church, and contractors have set up their work enclosure on the north side. 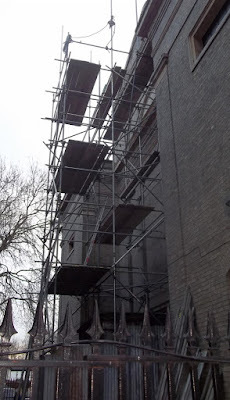 The good news is that the church roof is about to undergo much needed and extensive repairs, thanks to a grant of £100,000 which St James's has received from the Government's Listed Places of Worship roof repair fund.. 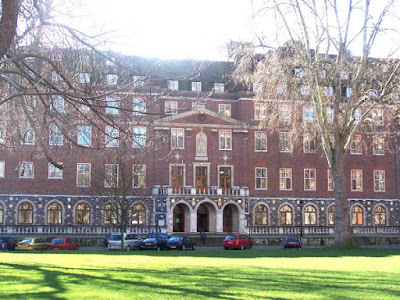 The grant doesn't cover the total cost but, with a contribution from our own building fund, we have been able to embark upon this work to help secure the future of St James's as the important and much-loved landmark that it is. The work is due to be completed early in May. Our next job is to repair the stonework, but that is another story. 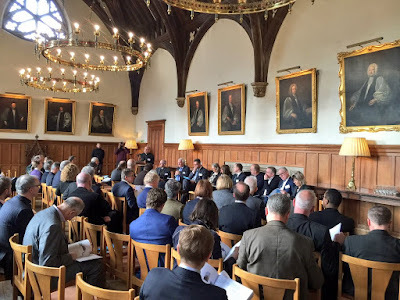 To Lambeth Palace, London home of the Archbishop of Canterbury, for Battersea to the Barrier, a consultation on the huge changes taking place on the south bank of the river between Battersea (in the west) and the Thames Barrier (in the east). The Mayor of London's thames-side 'opportunity areas' suggest there is scope for the construction of 60,000 homes and the creation of 93,000 jobs in the next few years bringing huge changes to the seventeen riverside parishes which include St James. Council leaders, including Peter Johns, leader of Southwark Council, directors of housing and planning, architects, archdeacons, developers, the deputy mayor of London (Policy and Planning), bishops, and vicars, came to the meeting convened by the Archbishop and the Dean of Southwark, to consider what makes for the good of the city as whole. The panel at the front were each asked to answer the question: 'a good city for all: what is your part in creating it?' and this was followed by questions and comments from the floor. With a huge growth in London's population forecast, with a desperate need for housing, with London contributing 25 per cent of the national GDP, there are big challenges ahead. One of the biggest challenges comes, of course, in the phrase 'for all.' For the poorer residents of the riverside parishes that is a crucial question. 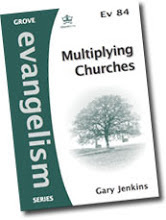 For the church there is a challenge to catch up with the changes - and even be ahead of the game. 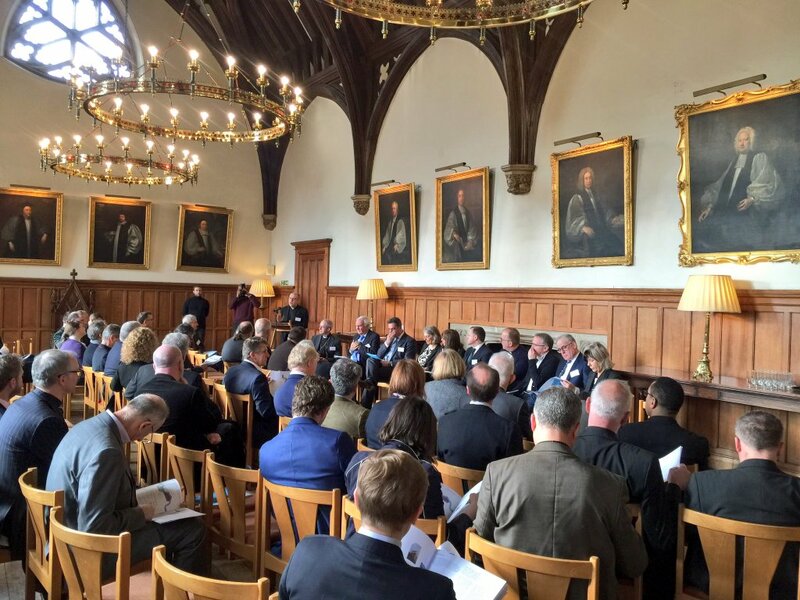 (Why aren't schemes coming forward with church buildings at the centre?, mused the leader of Southwark Council) - and then there is that very intriguing statistic offered by one speaker: London has the highhest rates of churchgoing of any city in Europe. That suggests a real opportunity for the church to make an impact for the good of the city. See the Battersea to the Barrier website for further details of the project. This Christmas my wife bought her sister-in-law a hamper which contained a number of items of food entirely made in Bermondsey. Things have come full circle. Fifty years ago Bermondsey was famed for all its food factories. Today they're coming back, but this time, they're under the railway arches. The growing number of specialist food outlets in Bermondsey featured on BBC1's Inside Out tonight. 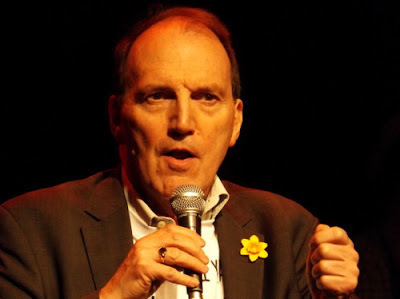 You can see the programme on iPlayer here. 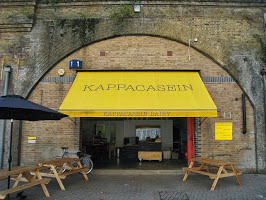 Go to 19.34 to see item on Bermondsey which particularly focusses on the Kappacasein cheese factory and includes a glimpse of St James's Church in the background. To Surrey Quays Shopping Centre to see the exhibition about the Canada Water masterplan. Canada Water is one part of our local area that is going to see big changes in the next few years with the old Daily Mail printworks, Surrey Quays Leisure Centre, and Surrey Quays Shopping Centre, making way for a huge new development that will include a new high street, town centre, a local par, plus lots and lots of flats, all over a fifteen-year period. Aneal Appadoo was the guest speaker at our Men's Breakfast which took place this morning at St James's, with a really good turn out of men for the usual full cooked breakfast. 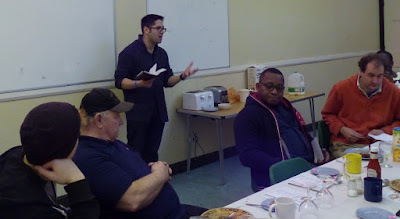 Aneal, who is currently the curate at Holy Trinity in Redhill, was talking about his own journey of faith. He had grown up going to church regularly and he had always assumed himself to be a Christian, but it was only as a young man of 19, that he came really to understand what a Christian was, and to have a personal faith in Christ: not just believing that there was a God, but knowing that Christ was God, and putting his trust in him as Lord and saviour. 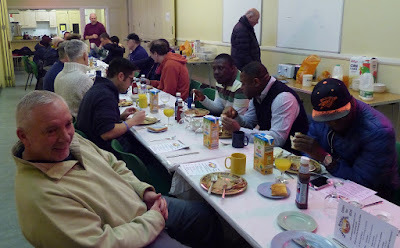 Over the years he grew in his faith, ran a restaurant, worked for a travel company, got married, became a dad, went to college and ended up as a full time sharer of the good news in Redhill. Happy Candlemas everyone, or to give it its proper name, the Presentation of Christ in the Temple. Today, 2nd February, is the day the church remembers the occasion when Mary and Joseph took their infant son to the Temple at Jerusalem to dedicate him to the Lord. I love that last bit, with my own eyes I have seen your salvation. He'd a waited a lifetime for it but the moment had come. 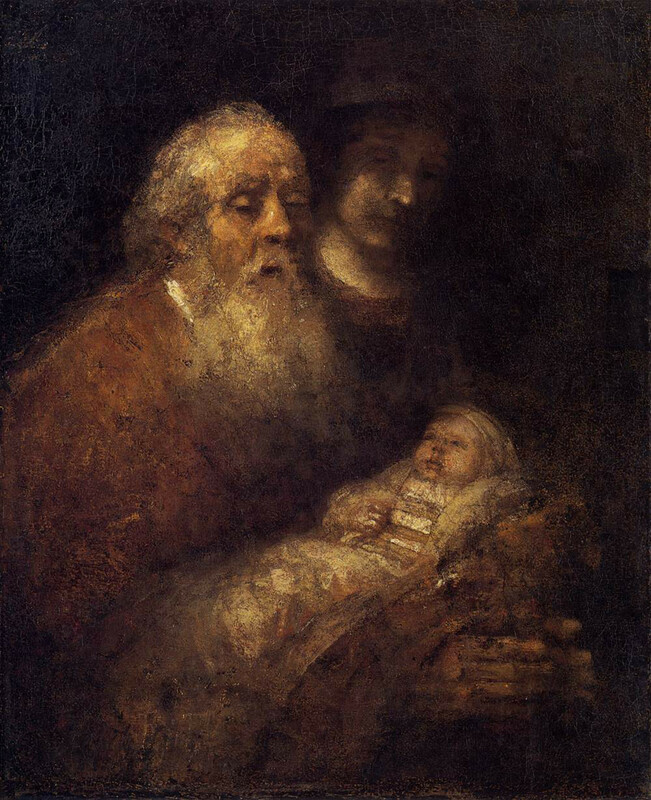 As he looked at the child in his arms, he saw Jesus for who he was: the saviour. He had seen salvation.